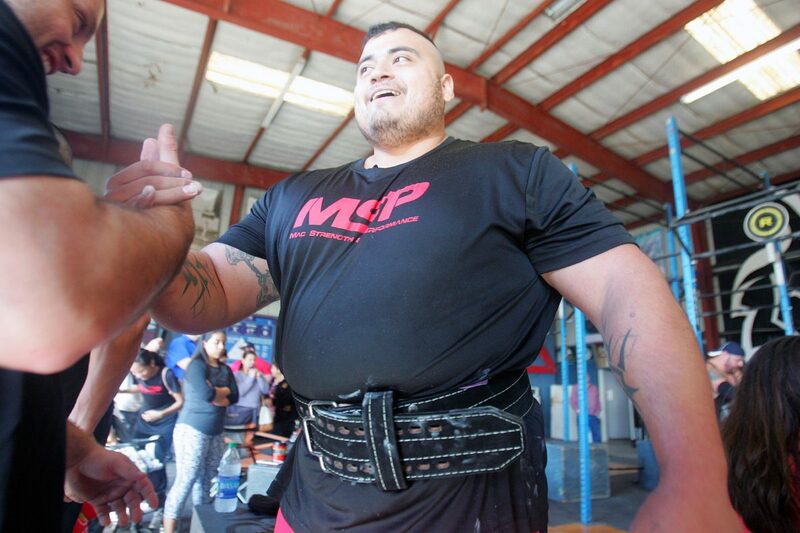 Juan Cortez is congratulated after competing in the Viking press event during the South Texas Strongest Man and Woman competition held at Alpha Fit on Saturday Feb. 10, 2018, in Edinburg. 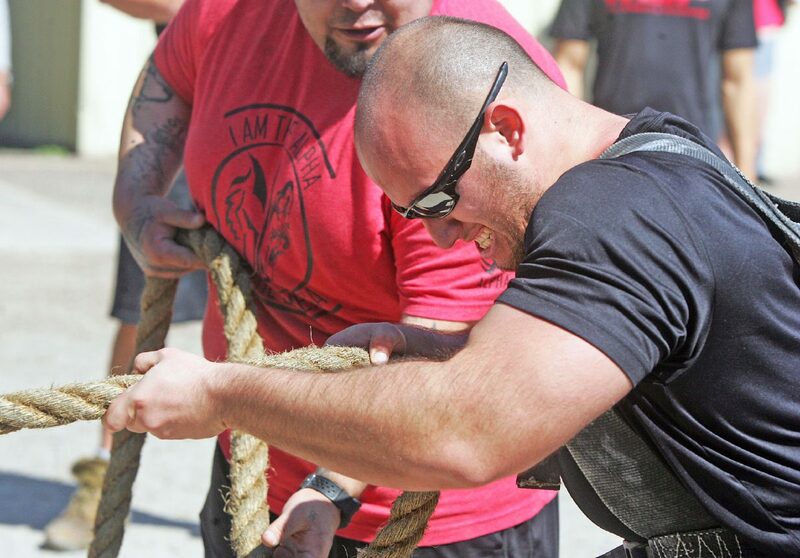 EDINBURG — McAllen native Carl Love attaches a thick rope to his torso, and begins to breathe strategically. On the opposite end is the front portion of a semitruck, which he’s tasked with transporting several yards within a one-minute time constraint. 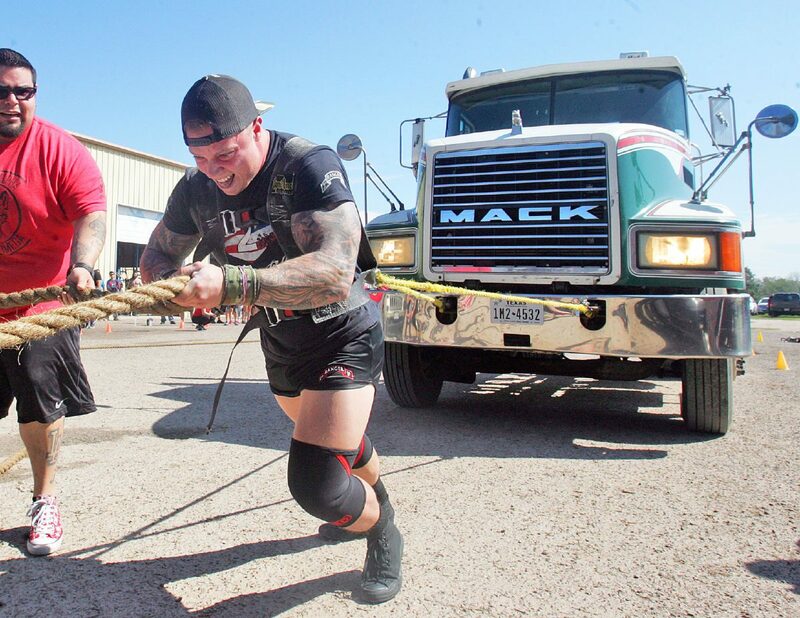 As he inches his way toward the finish line, he’s cheered on by several other participants of the fourth annual South Texas Strongest Man & Woman competition at Alpha Fit in Edinburg. Even though Saturday was Love’s first strongman competition, he won first place in the middleweight class for the “Big Rig Pull,” which he’s trained for during the past three months. Rob Figueroa pulls a truck using a rope and brute force as he competes in the Big Rig Pull during the South Texas Strongest Man and Woman competition held at Alpha Fit on Saturday Feb. 10, 2018, in Edinburg. 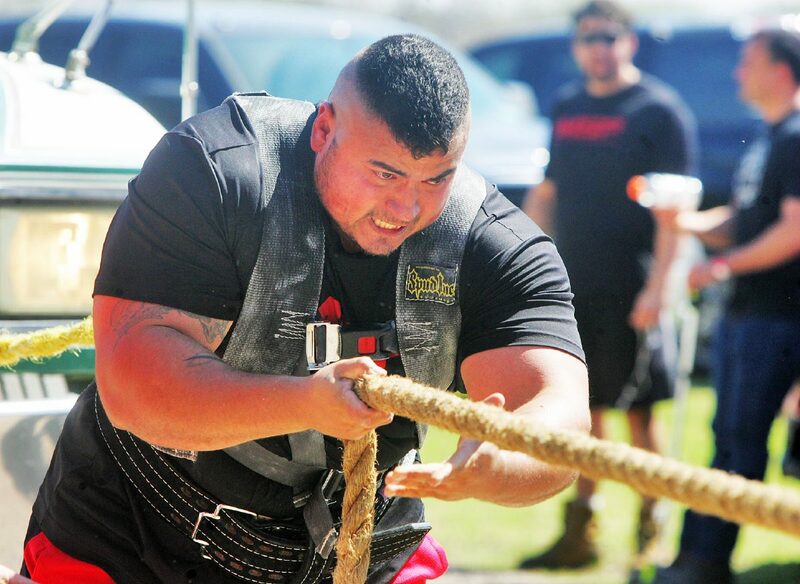 Alex Mancias pulls himself along as he competes in the Big Rig Pull during the South Texas Strongest Man and Woman competition held at Alpha Fit on Saturday Feb. 10, 2018, in Edinburg. 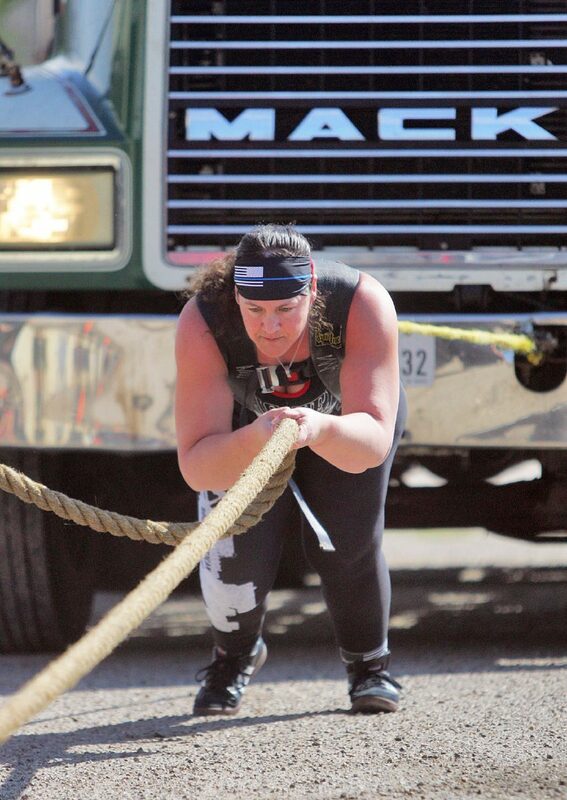 Melissa Seaman competes in the Big Rig Pull during the South Texas Strongest Man and Woman competition held at Alpha Fit on Saturday Feb. 10, 2018, in Edinburg. 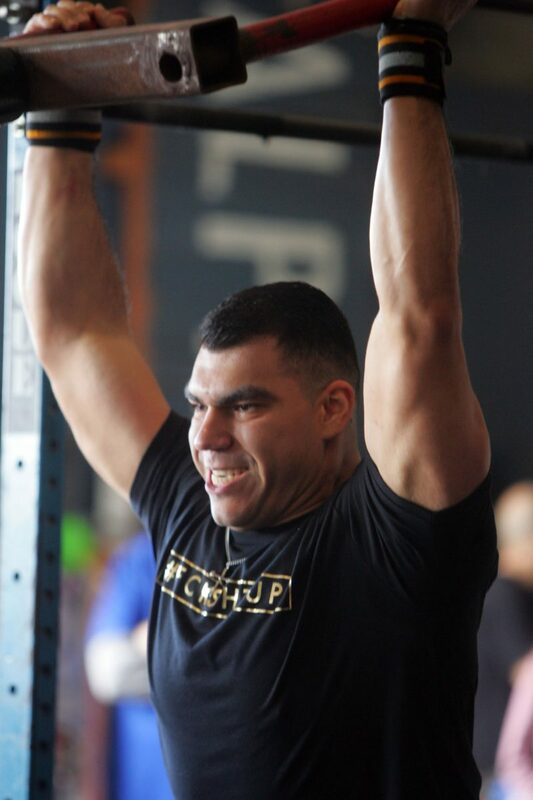 Juan Cortez competes in the big rig pull during the South Texas Strongest Man and Woman competition held at Alpha Fit on Saturday Feb. 10, 2018, in Edinburg. George Guerra competes in the Viking press event during the South Texas Strongest Man and Woman competition held at Alpha Fit on Saturday Feb. 10, 2018, in Edinburg. Many might not see pulling a large vehicle with sheer force as a practical skill. Gabriel Peña, owner of Alpha Fit and a “strongman” himself, said these types of workouts render “real-world strength,” as opposed to the traditional treadmill and bench press. But the competitive edge is what fuels many of the participants, he said. Despite this, you’ll never see a strongman miss an opportunity to cheer on a fellow competitor. The roughly 30 participants were categorized by weight class. There’s lightweight, middleweight, heavyweight, super-heavyweight (for men only) and masters, which includes anybody over age 40. Throughout the day, participants competed in the Viking press for reps, yoke walk/farmer’s carry medley, Mike Bartos competition axle max, deadlift, stone series carry and load and the most anticipated: The big rig pull — the iconic strongman competition event. This year, there’s a lot at stake. For the first time, the South Texas Strongest competition is nationally sanctioned, meaning anybody who places first in their division at Saturday’s competition qualifies for nationals. The opportunity brought people from around the state to Edinburg. Amanda Vogt owns a gym in San Antonio. Saturday was her first time traveling to the Valley, but she’s been going to strongman competitions across the state for two years. “They used to be only in Dallas, but now they’ve been popping up in Corpus and now down here,” Vogt said. There’s gender disparity in the sport, she said, but that trend is shifting as well. As the sport gains popularity, Peña hopes more people will muster the confidence to test their strength.